Stroke is a major cause of dementia, especially in Asian countries [1-3]. Although a recent study showed that the most common cause of dementia in South Korea was Alzheimer’s disease (AD) , vascular dementia remains an important cause. Stroke causes survivors to develop residual cognitive impairments or behavioral changes in addition to their physical deficits. Post-stroke dementia (PSD) is one of the main causes of dependency in survivors and includes any dementia after stroke, regardless of its underlying cause (AD, vascular, other degenerative, or mixed) . A study to determine the frequency of vascular cognitive impairment (VCI) using the Korean version of the Vascular Cognitive Impairment Harmonization Standards (K-VCIHS) and to investigate the feasibility of the K-VCIHS-neuropsychological (NP) test protocol in a multicenter, hospitalbased stroke cohort study in Korea has already been completed . It is hard to assess cognitive dysfunction in stroke patients because of their disabilities; therefore, brief and easily applicable tests are needed to screen for cognitive impairment among them. Many studies have used the Informant Questionnaire on Cognitive Decline in the Elderly (IQCODE) in investigating cognitive dysfunctions associated with stroke, because the IQCODE does not require the involvement of the person being assessed. While the IQCODE is useful for the assessment of pre-stroke cognitive decline such as Alzheimer’s disease (AD), its validity in determining PSD has been evaluated only in few studies [7,8]. This study aimed to evaluate the test accuracy of the Korean version of the IQCODE (K-IQCODE) as a screening tool for PSD. We performed this study by comparing diagnosis rate of PSD using both the K-IQCODE and the comprehensive NP tests in patients who were enrolled in our previous multi-center stroke cohort study (K-VCIHS study) at 3 months post-stroke. Among 899 acute stroke patients who enrolled in the K-VCIHS study, 506 patients underwent a follow-up evaluation, and 353 patients completed the 60-minute K-VCIHS-NP protocol at 3 months post-stroke. Of the 353 who completed the standard neuropsychology battery, 346 were evaluated using the follow-up IQCODE test as a screening tool for PSD. The number of subjects with VCI at 3 months poststroke was 221 (62.6%) of the 353 post-stroke survivors who completed the K-VCIHS-NP test protocol; PSD was diagnosed in 45 (12.7%) patients . To elucidate the test accuracy of the IQCODE as a screening tool for PSD, we evaluated the concordance rate for PSD diagnoses of the K-IQCODE and the Diagnostic and Statistical Manual of Mental Disorders, Fourth Edition (DSM-IV), criteria from the 60-minute K-VCIHS-NP test protocol for patients involved in the K-VCIHS study. At 3 months after stroke onset, the K-IQCODE was completed by a reliable informant (relatives or care givers) as the screening tool and 60-minute K-VCIHS-NP test protocol as the standard neuropsychology battery was performed. The standard NP tests were performed by well qualified neuropsychologists who had been blinded about the IQCODE data of each patient. Both tests have been validated and standardized with Korean subjects [6,9]. Diagnosis for dementia was performed according to the DSMIV criteria based on clinical interviews and cognitive functions assessed using 60-minute K-VCIHS-NP test, and social functioning status measured by the Instrumental Activities of Daily Living (IADL) scale at 3 months after stroke . A participant was categorized as having impaired cognitive functions if he/she scored below the 10th percentile on an individual domain of cognition. PSD was defined as dementia in poststroke survivors without regard to pre-stroke cognitive status. 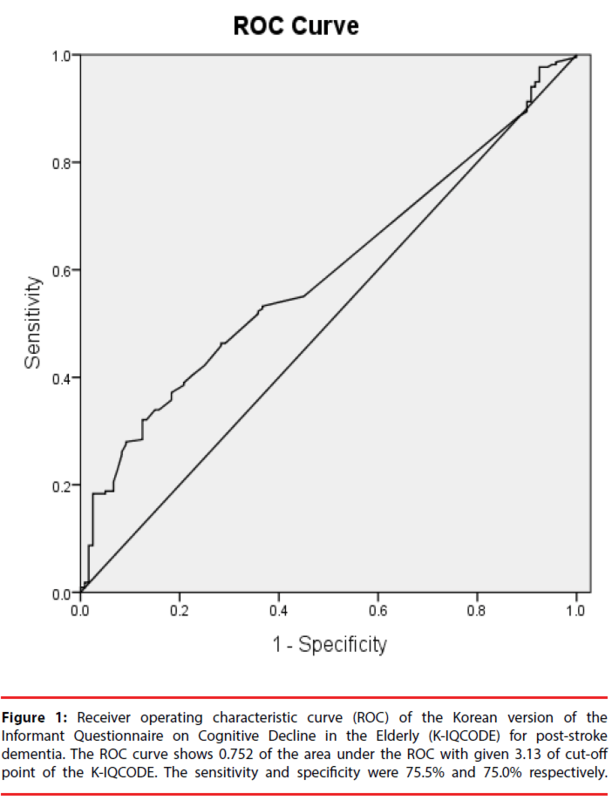 For the statistical analysis, the sensitivity, specificity and the area under the receiver operating characteristic (AUROC) curve of the K-IQCODE were measured against the clinical diagnoses. The concordance rate, defined as the number of overlapping cases between the K-IQCODE and 60-minute K-VCIHS-NP test protocol was evaluated with Cohen’s kappa coefficient. A two-sided P-value of less than 0.05 was defined as statistically significant. This study was approved by the Institutional Review Board of each participating hospital, and all subjects provided written informed consent. The mean age of the 353 stroke survivors was 63.9 ± 12.4 years, male gender was 38.8% and education level was 4.7 ± 1.7 years. Hypertension and smoking were frequent risk factors (62.9% and 44.3%, respectively). The mean score of National Institute of Health Stroke Scale score at admission was 3 and the proportion of poor premorbid status was 7.6% (modified Rankin score ≥ 3). When we compared to the stroke survivors with normal cognition, VCI patients were older (66.5 years, p < 0.001) and had more frequent history of hypertension (69.2%, p < 0.001) and diabetes (36%, p = 0.039). The subtype of ischemic stroke was different; the proportion of large artery atherosclerosis was higher in VCI patients (46.1%, p = 0.002) but, small vessel occlusion was less frequent in this group (21.3%, p< 0.001). The concordance rate of detecting PSD in the K-VCIHS-NP test protocol and the K-IQCODE at 3 months after stroke was 45.3% (Kappa value = 0.471, p < 0.001). When applying the K-IQCODE threshold of 3.6, which was designated for AD, the ROC curve showed sensitivity of 45%, specificity of 96%, and AUROC of 0.706. Suggested optimal cut-off points of the K-IQCODE for PSD are listed in Table 1. Taking the K-IQCODE threshold of 3.13 the sensitivity, specificity, and AUROC were 75.5%, 75.0% and 0.752 respectively. The ROC curve of the K-IQCODE for PSD with threshold of 3.13 is presented in Figure 1. Table 1: Suggested optimal cut-off point for the Korean version of the Informant Questionnaire on Cognitive Decline in the Elderly (K-IQCODE) for post-stroke dementia. Figure 1: Receiver operating characteristic curve (ROC) of the Korean version of the Informant Questionnaire on Cognitive Decline in the Elderly (K-IQCODE) for post-stroke dementia. The ROC curve shows 0.752 of the area under the ROC with given 3.13 of cut-off point of the K-IQCODE. The sensitivity and specificity were 75.5% and 75.0% respectively. This study is the first study of the K-IQCODE performance in the screening of PSD in Korean patients to the best knowledge of ours. This study showed that the concordance rate of detecting PSD in the K-VCIHS-NP test protocol and the K-IQCODE at 3 months after stroke was 45.3% and which indicates that the K-IQCODE might not be a useful tool to predict PSD. Whereas the K-IQCODE was validated and has a sensitivity of 90% and specificity of 70% for a cut-off of 3.6+ for screening of AD in Korea , the present study showed that the cut-off value for AD was not appropriate for screening of PSD because of low sensitivity (45%). Theoretically, perfect screening test has both 100% of sensitivity and specificity. However, sensitivity and specificity are so inversely proportional, indicating that it is important to search the optimal cut-off values of the tests. In general, the ROC analysis provides tools to select possibly optimal model and shows optimal discrimination threshold. According to arbitrary guidelines, screening tests with AUROCs over 0.8 - 0.85 are regarded as good tests. In this study, we tried to find another optimal value for PSD on the K-IQCODE instead of that for AD, but we failed to demonstrate optimal cutoff point with good sensitivity, specificity and AUROC to detect PSD in patients with poststroke state. This study was performed based on the K-VCIHS study, the first large-scale, multicenter study for VCI using 60-minute K-VCIHS-NP test protocol proposed by National Institutes of Neurological Disorders and Stroke and Canadian Stroke Network . Although 60-minute K-VCIHS-NP test protocol demonstrated its usefulness for evaluating cognitive impairment in post-stroke survivors in a multicenter cohort , the necessity of easily and rapidly applicable screening tool for cognitive impairment in poststroke patients is still remained. As for the screening tool for cognitive impairment, the MMSE is the most commonly used test and many studies have used it for diagnosis of dementia. Nonetheless, the pattern of PSD cognitive deficit may involve a preponderance of so-called “executive” dysfunction unlike AD. Therefore, NP test protocol must be sensitive to a wide range of cognitive abilities and especially attuned to the assessment of executive function to diagnose PSD. To this end, further validation of the IQCODE for screening for PSD had been required and we were able to perform a far more reliable evaluation of the K-IQCODE for screening PSD. The IQCODE is the most widely used informant-based screening test for cognitive abilities . It was originally developed as a way of measuring cognitive decline from a premorbid level using informant reports mainly in degenerative dementia such as AD. It validly reflects past cognitive decline and is relatively unaffected by education, pre-morbid ability, or proficiency in the culture’s dominant language . The IQCODE has been used for assessment of pre-stroke and post-stroke cognition and to aid prognosis; indeed, the properties of IQCODE vary according to the purpose of testing . There have been many studies that investigated cognitive dysfunctions associated with stroke using the IQCODE to evaluate prestoke cognitive impairment [5,15], however only few studies have evaluated the value of the IQCODE as a screening tool for PSD. Nevertheless the possibility of the biases of informants, the IQCODE has drawn attention for screening of PSD because of its strengths; especially it does not require the participation of the stroke patients. While Tang et al. concluded that the IQCODE did not appear to be a useful tool for screening PSD because of its low predictive value  and Srikanth et al. also reported that both the MMSE and the IQCODE were individually poor at detecting cognitive impairment after first-ever stroke in community-based stroke cohort , some studies showed the usefulness of the IQCODE as a screening tool [16-18]. The diagnosis of PSD must be influenced by the diagnostic criteria itself. More extensive NP test protocols have more chance to find the cognitive dysfunction in stroke survivors. So standardized comprehensive NP test protocol is essential to evaluate the validity of screening tool for PSD. Because this study is based on the large-scale, multicenter study for VCI using the 60-minute K-VCIHS-NP test protocol, the participants in this study were all evaluated under the same standardized extensive NP test protocol. A higher frequency of VCI using comprehensive neuropsychology protocol at 3 months (62.6%) compared to the results in which post-stroke cognitive impairment were defined using the MMSE; previous Chinese study (37.1%)  and K-VCIHS study itself (26.4%) showed the importance of diagnostic standard test in validation of screening test for PSD . In conclusion, we found that the IQCODE was not suitable for screening PSD at 3 months after stroke because of its low sensitivity around the cut-off points for AD. We investigated other suggested optimal cut-off points on the IQCODE for PSD, but found these were also unsuitable. Further studies to find easily applicable screening tools for detecting PSD are needed. These studies should focus on instrument reliability and comprehensive NP tests. The authors would like to particularly thank all the members of the Korean VCIHS study group and all the other members of Hallym Stroke Forum (MW Chang MD, JS Lim MD, and SH Lee MD). This study was supported by a grant from the Hallym University Specialization Fund (HRF-S-53) and the Korea Healthcare Technology R&D project, Ministry of Health and Family Welfare, Republic of Korea (HI16C1078). Jorm AF, Korten AE, Henderson AS. The prevalence of dementia: a quantitative integration of the literature. Acta. Psychiatr. Scand76(5), 465-479 (1987). Yeo G, Gallagher-Thompson D, Lieberman M. Variations in dementia characteristics by ethnic category. In: G Y, Gallagher-Thompson. Ethnicity and the dementias. Washington, DC: Taylor and Francis 21-30 (1996). Manly JJ, Mayeux R. Ethnic Differences in Dementia and Alzheimer's Disease. In: NB A, RA B, B C. Critical Perspectives on Racial and Ethnic Differences in Health in Late Life. Washinton, DC: National Academies Press (US) 95-141 (2004). Kim KW, Park JH, Kim MH, et al.A nationwide survey on the prevalence of dementia and mild cognitive impairment in South Korea. J. Alzheimers. Dis23(2), 281-291 (2011). Barba R, Martinez-Espinosa S, Rodriguez-Garcia E, et al. Poststroke dementia : clinical features and risk factors. Stroke 31(7), 1494-1501 (2000). yu KH, Cho SJ, Oh MS, et al.Cognitive impairment evaluated with vascular cognitive impairment harmonization standards in a multicenter prospective stroke cohort in Korea. Stroke44(3), 786-788 (2013). Tang WK, Chan SS, Chiu HF, et al.Can IQCODE detect poststroke dementia? Int. J. Geriatr. Psychiatry18(8), 706-710 (2003). Srikanth V, Thrift AG, Fryer JL, et al.The validity of brief screening cognitive instruments in the diagnosis of cognitive impairment and dementia after first-ever stroke. Int. Psychogeriatr18(2), 295-305 (2006). Lee DW, Lee JY, Ryu SG, et al.Validity of the Korean Ve rs ion of Informant Ques tionnaire on Cognitive Decline in the Elde rly(IQCODE). J. Korean. Geriatr. Soc9(3), 196-202 (2005). Kang SJ, Choi SH, Lee BH, et al.The Reliability and Validity of the Korean Instrumental Activities of Daily Living (K-IADL). J. Korean. Neurol. Assoc20(1), 08-14 (2002). Hachinski V, Iadecola C, Petersen RC, et al.National Institute of Neurological Disorders and Stroke-Canadian Stroke Network vascular cognitive impairment harmonization standards. Stroke37(9), 2220-2241 (2006). Jorm AF. The Informant Questionnaire on cognitive decline in the elderly (IQCODE): a review. Int. Psychogeriatr16(3), 275-293 (2004). Jorm AF, Jacomb PA. The Informant Questionnaire on Cognitive Decline in the Elderly (IQCODE): socio-demographic correlates, reliability, validity and some norms. Psychol. Med19(4), 1015-1022 (1989). MijajloviÃÂ MD, PavloviÃÂ A, Brainin M, et al.Post-stroke dementia-a comprehensive review.BMC Med15(1), 11 (2017). Henon H, Durieu I, Guerouaou D, et al.Poststroke dementia: incidence and relationship to prestroke cognitive decline. Neurol57(7), 1216-1222 (2001). Harwood DM, Hope T, Jacoby R. Cognitive impairment in medical inpatients. I: Screening for dementia-is history better than mental state? Age. Ageing26(1), 31-35 (1997). Klimkowicz A, Dziedzic T, Slowik A, et al.Incidence of pre- and poststroke dementia: cracow stroke registry. Dement. Geriatr. Cogn. Disord14(3), 137-140 (2002). Starr JM, Nicolson C, Anderson K, et al.Correlates of informant-rated cognitive decline after stroke. Cerebrovasc. Dis10(3), 214-220 (2000). Zhou DH, Wang JY, Li J, et al.Frequency and risk factors of vascular cognitive impairment three months after ischemic stroke in china: the Chongqing stroke study. Neuroepidemiol24(1-2), 87-95 (2005).